Description: Letters and conversations of a humble man who walked constantly in the presence of God, Brother Lawrence. Millions have learned to live in the presence of God through this simple book written by a humble monastery cook. 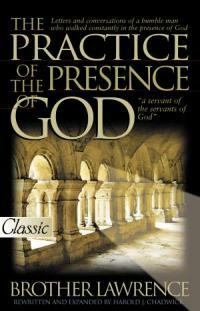 Published first in French in 1692, The Practice of the Presence of God is a classic for everyone who has a heart that is hungry for more of God. Whose soul thirsts for God, for the living God. Amid his pots and pans, the author, Brother Lawrence, became so noted for his serenity and joy while he worked at the most menial kitchen tasks, that cardinals and theologians came to see him to learn his secret. Even the pope of his day is said to have visited him. If you want to feel the presence of God as this simple man did, then read what he wrote about what he did to feel the closeness of God every minute of every day.